Age Concern look after the interests of elders in the community. The Tauranga branch needed a local site focusing on the news, events and activities happening in the area. The branch manager asked me to create a design that would be easy to read, navigate and administer with new content. To keep the costs low, I re-used the same content management system that I started to build for Tauranga SPCA's upgrade. It shard most of the features that Age Concern might use: donations, membership, sponsorship, news and events. I customised the original system with some additional features, developed a basic "responsive" theme and supported the branch manager with content loading. 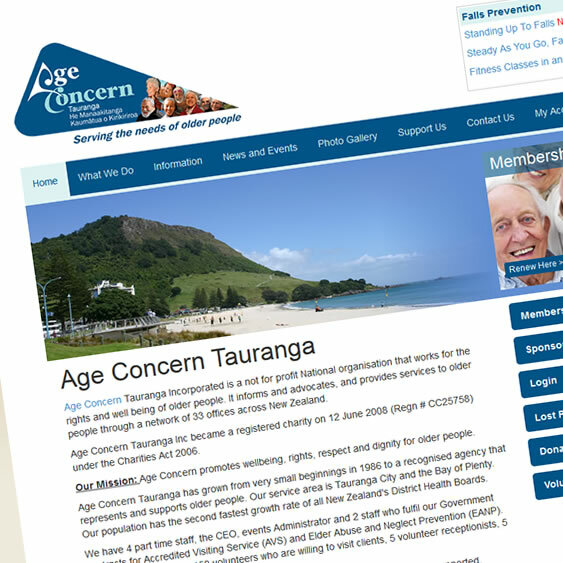 If you are looking for a fitness class in or around Tauranga, visit Age Concern's fitness section. The fitness section was developed with the support of the ACC as part of an initiative to help prevent falls.